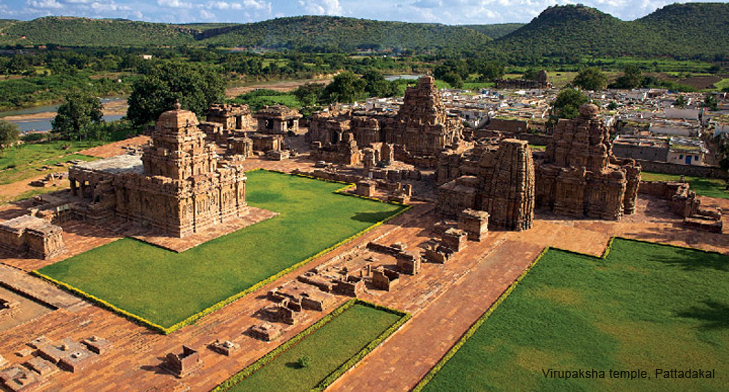 Once the destination of kings, Pattadakal was where kingdoms were bestowed upon heirs apparent. The official coronation destination, the temples at Pattadakal which literally translates into coronation (pattada) stone (kallu) has a collection of temples that skew towards both the North Indian and South Indian styles of temple architecture. With sculptures and details intact, these temples narrate their stories with clarity; stories so powerful, that they resonate across centuries. Aihole-Badami-Pattadakal Bright yellow sunflower fields, red-ochre sandstone outcrops and cobalt blue skies. The journey to the Badami-Aihole-Pattadakal belt is a painting in the primary colours. The road to the past is nothing short of spectacular. Aihole has to be god&apos;s collection of temple prototypes. Believed to be the cradle of Dravidian temple architecture, Aihole&apos;s temple compendium spans styles and centuries, some as early as the 5th century - and some, like the Durga Temple is built on design that is seen nowhere else in the country. The Badami Chalukyas first had their capital at Aihole before they moved to Badami and it&apos;s justified in resting on its ancient laurels. For, Aihole has a lot of ancient laurels. Pattadakal, similarly, has a finger lodged in the book of time - when it was the place where kings were coronated. A little away from Aihole, Pattadakal stands like an island of majesty - just like its name suggests: pattada kallu translating into coronation stone. A complex of eight temples, each one commemorates a landmark event in the history of the Chalukyas, which in turn was one of South India&apos;s most vibrant dynasties. The Malaprabha River flows by both Aihole and Pattadakal, a silent witness now as it was then. Peeking from crags high above are the remnants of what look like watchtowers. You never know what you might encounter in the thick shrub undergrowth. Leopards have been known to pay unwelcome visits to the nearby villages to drag cattle away. Just a few kilometres apart, Aihole, Pattadakal and Badami can be covered in a day - a day well spent, at that! Badami is a snapshot of the past, where the elements, both natural and manmade, have been fixed in a tableau as if afraid to move on from a love affair that&apos;s well and over now. The love affair being, the glory days of the Badami Chalukyas who&apos;d moved their capital to Badami in the apogee of their run as a dynasty. Karnataka is a rambling old storyteller, and the most exquisite stories it has. Every place is steeped in legend and myth, and Badami with the Agastya Lake flanked by two rocky, almost-rectangular sandstone hills represent the Sage Agastya and the two ill-behaved demons Vatapi and Ilvala. It&apos;s a steep climb up to its rock-cut cave temples. The four temples which are hewn into a rock, one level above the other, has the most exquisite carvings from the Hindu myths and the top most one, dedicated to the Jain faith, has iconography representing the thirthankaras who are considered the pillars of the faith. The view from here in the evenings is the stuff of epics. And yet, it pales in comparison with the one from the North Fort, which lies on the opposite hill. Man-made as it might be, the Agastya Lake has an untouched air about it, made complete by the brown sandstone Bhootanatha Temples that stand on its edge like ephemeral maidens, who might vanish any moment - so beautiful, that they&apos;re almost a mirage. Dedicated to the god of spirits and ghosts, the beauty of the Bhootanatha Temples glistening like a fleeting apparition in the dusk will haunt for a long, long time after you&apos;ve left Badami.